“I ask forgiveness of all those I have offended and I hope to be able to do it personally in the coming weeks,” the pope said in the letter. Several survivors apparently have been invited to the Vatican to meet the pope. 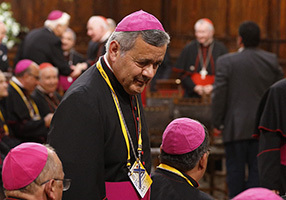 Abuse victims alleged that Bishop Barros – then a priest – had witnessed their abuse by his mentor, Father Fernando Karadima. In 2011, Father Karadima was sentenced to a life of prayer and penance by the Vatican after he was found guilty of sexually abusing boys. Father Karadima denied the charges; he was not prosecuted civilly because the statute of limitations had run out. A short time later, the Vatican announced that Pope Francis was sending a trusted investigator to Chile to listen to people with information about Bishop Barros. Pope Francis said Archbishop Scicluna and his aide, Father Jordi Bertomeu Farnos, heard the testimony of 64 people and presented him with more than 2,300 pages of documentation. Not all of the witnesses spoke about Father Karadima and Bishop Barros; several of them gave testimony about abuse alleged to have occurred at a Marist Brothers’ school.